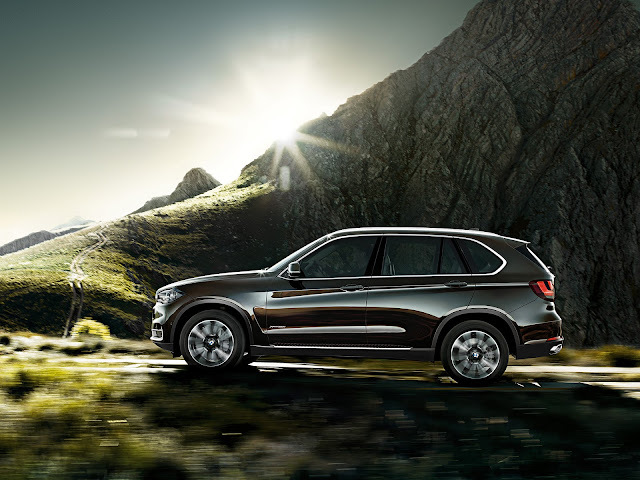 An ideal combination of sportiness, looks and adventure: the optional Design Pure Experience package underlines the self-confident character and impressive appearance of the BMW X5. 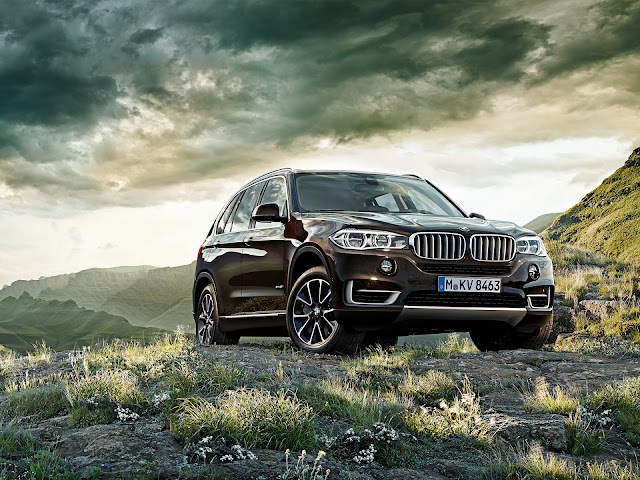 A BMW X5 equipped with Design Pure Experience exudes a majestic presence – whichever way you look at it. The visual engine in brushed steel at the front, rear and side, the air inlets with a differentiated look and the tailpipe and grille bars in silver matt lend an imposing air to the entire vehicle. The X -5 come with 2,979 ccm engine having 6 cylinder 4 valve, which produce 305 hp at 5,800 and 400 NM torque at 1,200-5,000. The top speed of X5 is 235 Km/h . It touches 0-100 Km/h in just 6.5 sec. The BMW X5 M50d benefits from the unique expertise of BMW M engineers, with a special, fine-tuned powertrain, suspension and steering system. The end result is an automobile that offers an exhilarating combination of sheer dynamism, comfort and everyday usability. The M Performance TwinPower Turbo straight six-cylinder diesel engine combines common rail direct injection and a unique three-stage turbocharger with variable turbine geometry. Extremely eager response, high torque at low revs and a wide rev range characterise this exception power unit. These engine characteristics make for spontaneous dynamics, with 740 Nm torque, a peak output of 280 kW (381 hp) and acceleration from 0 to 100 km/h in just 5.3 seconds. This impressive performance combines with average fuel consumption of 6.7 l/100 km and CO2 emissions of 177 g/km to produce an outstanding dynamics-to-efficiency ratio, thus once again underlining the the innovative power of BMW. The BMW X5 M50d gains its unmistakable character from the model-specific harmonisation of steering, suspension and the intelligent BMW xDrive all-wheel drive system. The Adaptive M suspension ensures that the BMW X typical agility takes an even sportier quality on board. Dynamic Damping Control and air suspension for the rear axle are designed for an ultra-sporty drive, profiting from exact, precisely-controllable handling qualities. The Adaptive Suspension Package Dynamic gives the BMW X5 M50d maximum agility, precision and lateral dynamics. Model-specific Dynamic Performance Control and Dynamic Drive guarantee even more neutral steering and reduce body side tilt on bends. With its dynamic, upright proportions, the third-generation BMW X5 is instantly recognisable as a BMW X model. However, it also has several new design features which further emphasise its majestic appearance and unbeatable versatility. One important element of the optimised design is the focus on aerodynamics. 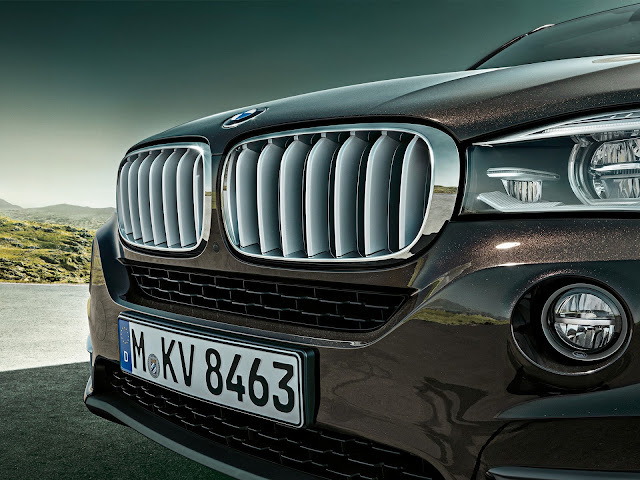 Thanks to eye-catching elements in the front end, at the rear and on the sides, form and function are combined ideally: large air inlets, the Air Curtain in the front apron and the newly developed Air Breather in the front wheel arches underline the sporty character of the BMW X5 – and, at the same time, help to reduce fuel consumption and CO2 emissions. The aerodynamic shape continues at the rear. The Air Blade on the D-pillar not only makes the car look wider, but also improves airflow. At the front, the flat, wide design of the BMW kidney grille gives the BMW X5 and an imposing athletic presence. The kidney grille and the headlights are ‘combined’ with each other, creating the impression of an all-in-one unit and emphasising the vehicle’s wide track. At the same time, the short distance between the A-pillar and the front axle shifts the visual focus of the car further forwards, thus highlighting the all-wheel drive. Top-quality leather, refined surfaces, atmospheric lighting and maximum comfort: Immerse yourself in the interior of the BMW X5 and feel the exclusiveness. While the bodywork of the BMW X5 is characterised by an imposing presence, the interior is dominated by a striking elegance. The horizontal contours and contrating surfaces heighten the feeling of space. Top-quality materials and interior surfaces, combined with a large selection of upholsteries and colours as well as atmospheric lighting, create an unrivalled feel-good factor. Clarity also plays a major role inside the BMW X5. 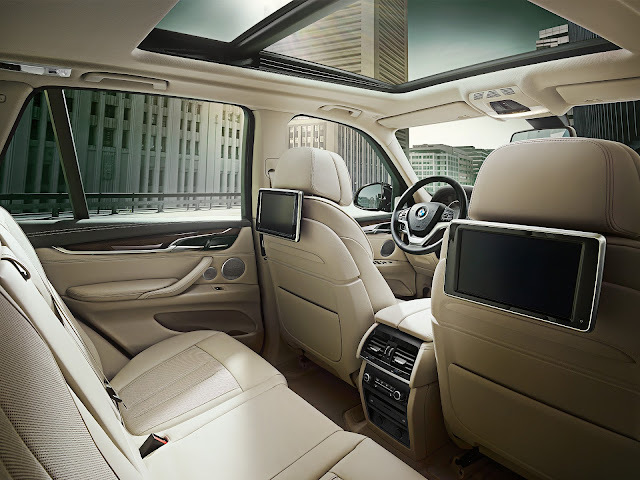 The elevated, BMW X typical seating position ensures the best possible view of the road ahead. All operating elements, including the new iDrive Touch Controller with the optional Navigation system Professional and the new free-standing Control Display, are orientated towards the driver. An interior mirror with automatic anti-glare function as standard ensures even more safety and comfort. The Adaptive LED Headlight comprises an accent light, low-beam and high-beam function, anti-dazzle high-beam headlights, LED fog lights, cornering light, turn indicators, daytime driving lights and Adaptive Headlight with variable light control. Light distribution is automatically adapted to match speed and depends on the steering angle. The colour of the light is similar to daylight: together with optimum, homogeneous illumination of the road, this improves visibility so as to eliminate fatigue when driving at night. The four headlamp light rings ensure a distinctive appearance. The Adaptive LED Headlight is expected to be available from the 4th quarter 2013. Price : The starting price of X5 is Rs 63,80,000 - 78,90,000 .